Why choose BOA Plant for your Crane Hire? BOA Plant offers a wide range of mobile all terrain cranes in many different capacities to ensure all your lifting needs are met. 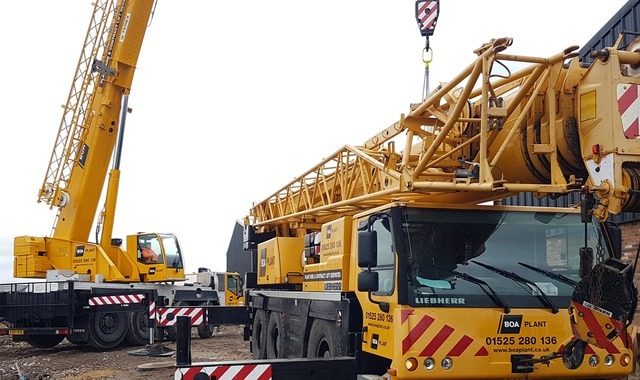 We provide a first class crane service, either on a contract lift or hire and managed basis. For clients requiring contract lift hire, BOA’s technical team will provide a full consultancy and design engineering service, offering the most cost effective lifting solution. We use the latest CAD and lift planning technology which enables us to simulate lifting operations prior to your crane arriving on site. Our professional and competent team are ready to make your project a success! What is the difference between CPA Hire and a Contract Lift? In basic terms, a CPA Crane Hire is the hiring of the mobile crane and a qualified operator to work on your site or project. The responsibilties for the planning, specification and management on site is down to the person or company hiring the crane. A Contract Lift service means that the hirer takes responsibility for the aspects of the lift, providing an experienced and competent 'Appointed Person' to complete the necessary site visits and lift plans, taking responsibility for the specification of the crane ensuring its suitability for the task and complete the on site supervision of the lift.